What do you do with an Australian Suzuki ‘Water Bottle’ that’s been left in a chicken coop for more than 20 years? Restore it, says Carl Schubert, who told his story to pal Karl Webster. You just gotta love the sound of a screaming two-stroke motorcycle. When you ride them, they give you an incredible sensation and an indescribable tingle somewhere. Whether it’s a two-stroke road or a two-stroke dirt bike, if you’ve experienced and owned one, they have that crazy sound and power delivery. I guess most of us started out years ago with two-strokes. Living Down Under, for me it was Suzuki RM80s and the like, and back in the day it would be something air-cooled with fins that made them sound even rawer. They would be easy to work on and could be flogged hard! Every so often just put a new set of rings in, maybe a piston now and then sometimes the odd plug and clean the air-filter. Once in your system I don’t think it ever leaves you. I thought I would never get used to the power of my first RM80, but then as experience grew the bikes shrunk, so weeks later I was thrashing it everywhere, then a 125 took its place, then a 250 and finally a 500 two-stroke… I still love strokers and this love is shared by another Karl, or should I say another ‘Carl’, Carl Schubert. Carl is a bike builder who does his own bikes to such a standard it makes you weep for your own bikes and want to go and re-do a few things. With this in mind the bike was relatively complete but neglected. A deal was struck and Carl took the bike home. What should have been a refresh, turned into a complete frame-up restoration. 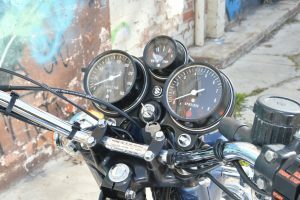 Having tinkered with bikes all his life but not a mechanic, Carl knew the enormity of the decision to restore rather than refresh however the six-week time-frame initially set in December 2006 may have been naïve! 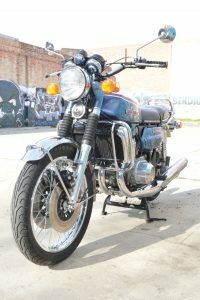 November 2011 saw the restoration complete with the bike rolling out of the shed looking as close to showroom condition as practical. The engine was stripped and found to be reasonably healthy although it had obviously seized at some point with tell-tale history marks in the bores. 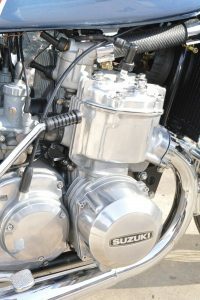 The Suzuki CCI oil-injection mechanism had been retained and the crank bearings were in good shape. Not too many two-strokes enjoy standing around idle for that many years though and the crank seals were no longer serviceable. Oxidisation had also taken its toll on the outside of the engine with most parts severely corroded. Many hours of wet and dry sanding, polish and repeat produced the results Carl was looking for. The frame was stripped and powder-coated maintaining the correct combination of gloss and satin black for the different parts and while the frame looks fantastic. All chrome and zinc plating was initially placed in the hands of a local contact to arrange, however a malfunctioning moral compass of said contact saw most of the original bright-work (including the hard to come by original exhaust system) make its way onto the open market never to be seen again. The reason for the delay in finishing the restoration now becomes more apparent! “The search for replacement parts saw many nights spent trawling the internet,” says Carl. 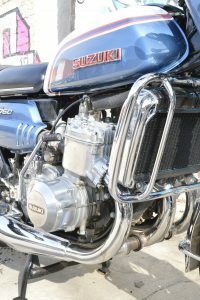 “With excellent contacts made and parts sourced through Crooks Suzuki and Discount Motorcycle Spares, both in the UK, my contacts made through the VJMC also proved invaluable when sourcing parts, although I found it easier to get parts for my Suzuki RE5 than for the GT at times!” Carl was keen to fit the parts that were correct to the 1973 K model. 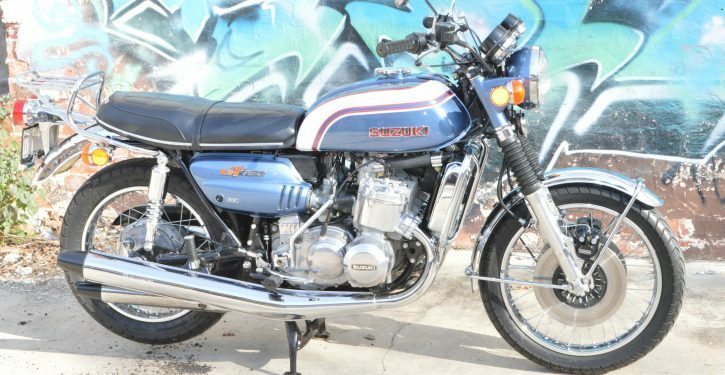 Subtle changes to the GT750 were made through its production run from 1972 to 1977. Correct lenses, engine covers, badges and seat are all present on the bike, as are the very hard to come by ‘S’-logo mirrors that demand a premium whenever they come up on the internet auction sites. An investment in a zinc-plating kit saw the majority of the smaller items plated and polished in the home workshop. Carl says that one of the most satisfying results of his plating exploits was the fan blade that was zinc plated and then subjected to ‘passivation’ to take on the brass colour as per original spec. The magnificent paintwork was completed by Hammond Refinishing in Wangaratta Victoria and many miscellaneous components such as the master cylinder, forks and calipers were reconditioned by Cal Merlo at www.badgereplicas.com.au who also supplied the reproduction tank and side-panel badges. By the start of 2011, nearly every component had been individually restored or replaced with new. A stint off work for medical reasons saw Carl and his two sons, Bryce and Tyler, spending time in the workshop firstly working out what went where and then slowly piecing the bike back together. The good sense to take a lot of digital photos during the strip-down process made the job a little easier when combined with a factory parts manual as reference. The euphoria was almost instantly dampened, quite literally, by a serious water leak. All obvious sources were quickly eliminated with the bypass hose that runs behind the cylinders found to be the cause and yes, it was the bottom clamp that had let go providing both Carl and Pete with an opportunity to practice getting the air-box and carbs off again and see if they could better their four-hour installation time at the second attempt. Water leak rectified, the heightened expectation of giving the bike its maiden run returned with all pre-checks passing with flying colours. Despite the ground-up restoration, this bike isn’t just for show – it’s had plenty of go, too. The bike is still ridden to a lot of VJMC events and was a multiple trophy winner at the 2013 VJMC National Rally held in Victor Harbor in South Australia. 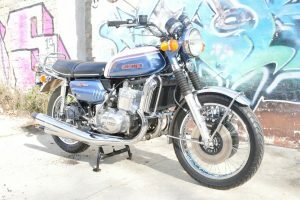 In addition to the People’s Choice award for the best bike 1970 to 1980, the bike took the VJMC Founders’ Award which is presented to the bike that is judged to be as close to how it rolled off the factory floor but obviously still ridden and enjoyed. There have only been five awards of this nature presented in the history of the VJMC in Australia. 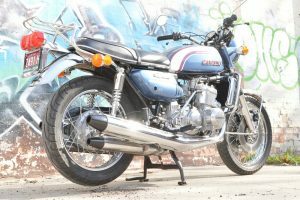 The GT750 completes Carl’s collection of the Suzuki triples with him also owning the 380 and 550 variants.